Let me just start this post saying, I am not by any means OCD or a germaphobe. However, when it comes to birthday cake, that’s another story. I have a big family and we all love celebrating birthdays! When it comes time to decorate, everyone wants to pitch in (even if we are the only ones to see it.) The same goes for the cake. When it comes time to blow out the candles, most people think it’s fun and to “make a wish”. My thought is please don’t spit on the whole cake!! All I see is a kid who is so excited about their birthday, cake, presents, the whole nine yards, who may be perfectly healthy or may have just gotten over a cold. Either way, when they go to blow out the candle, they are spreading their germs and sometimes spit over the whole cake. So a few years ago, I decided to start making cupcakes instead of one big cake. This way, I can give the birthday kid his own cupcake with a number candle to blow out and they can’t spit or blow germs on anyone else’s cupcake. Now you can make some really cute designs with cupcakes and sometimes have an even better looking dessert. But that’s not really me either. I like to keep my life as simple as possible, especially with five boys. 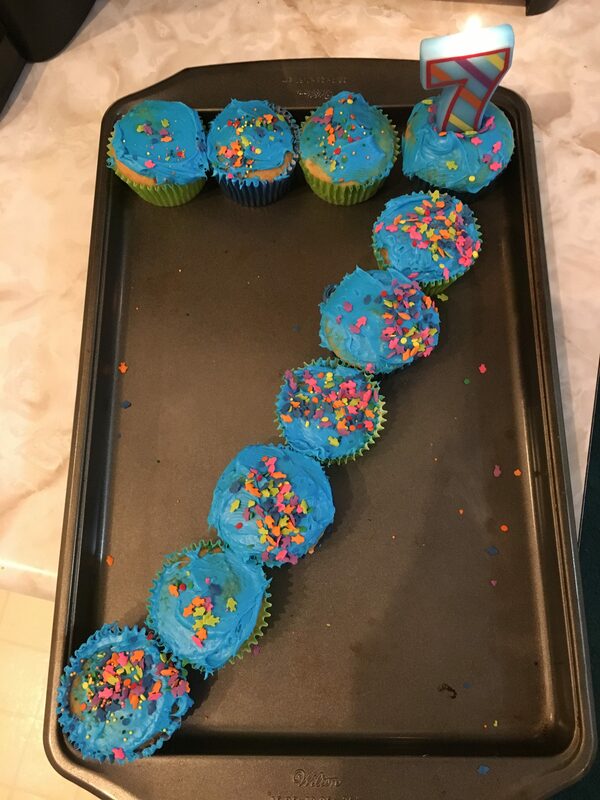 I decided to put the cupcakes in the number shape of that particular birthday. I love to use a funfetti cake because, what kid doesn’t like sprinkles inside their cupcake?!? From there, I will let the birthday boy choose the color of the frosting as well as the sprinkles to go on top. This makes it their own without making it stressful for me. This is not fancy, by any means, but it is quick and easy!